Turkish Foreign Minister Ahmet Davutoglu on Sunday warned that Crimea’s referendum on seceding from Ukraine pose the threat of a “domino effect” in Eurasia. 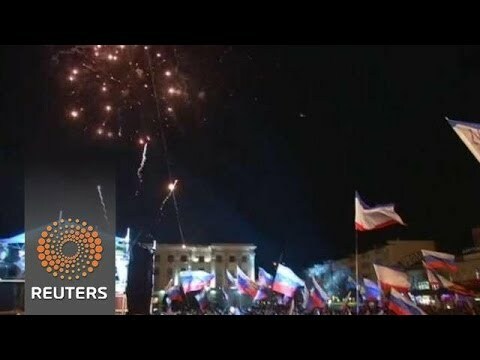 Will Russia’s rush to referendum and the outcome affect other populations who want to secede, throughout the world? Will it destabilize the current world order? Davutoglu likely had the Kurdish issue in mind. The some 2 million Kurds in northeast Syria have de facto seceded from Syria, and have fought off both regime troops and the guerrillas of the extremist Sunni Arab al-Qaeda affiliates. Their de facto secession has disturbed Turkey, which has a big Kurdish population of its own in the southeast, and which has fought Kurdish separatist guerrillas of the Kurdish Workers Party (PKK) for decades. The Kurds in northern Iraq likewise have a semi-autonomous statelet; Turkey now has good relations with that enclave, but there have been tension in the past, and Turkey certainly doesn’t want the Iraq model of ethnic conflict and separatism to spread to Turkey. Beyond the Kurdish issue, there is a sense in which the Sunni Arab cities of Falluja and Ramadi in Iraq have de facto seceded, under the leadership of the extremist Islamic State of Iraq and the Levant. The Shiite-dominated Iraqi army is probably strong enough to take those cities back for the central government, but Sunni Arab grievances against the Center are growing. In Europe, secessionists in Scotland and Spain’s Catalonia will likely take hope from Crimea’s secession vote. The Spanish central government will be upset (it still has not recognized Kosovo). To be fair, the Catalan leader was careful to distinguish his province’s aspirations from the events in Crimea, underlining that the elements of coercion and violence visible in the latter are absent in Catalonia. Even in Ukraine itself, some activists in the East of the country where there are substantial numbers of Russian-speakers, want the same deal Crimea got. If that process, of yet another partition, goes forward American-Russian relations will be deeply harmed. One thing is certain: The EU rashness in making Urkaine choose between it and Russia; and the Russian boldness in arranging for Crimea to be detached from Ukraine, have spread instability not only in Ukraine but throughout the region.